Kate Moss pays tribute to David Bowie in the coolest way | HELLO! 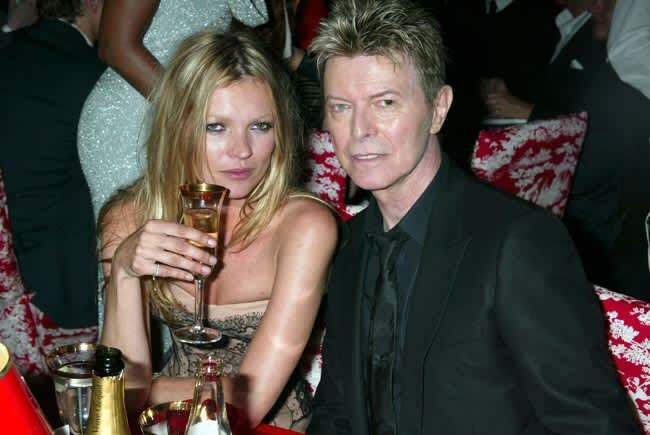 Kate Moss enjoyed a close friendship with music legend David Bowie. So it came as no surprise that the supermodel chose to pay tribute to the rocker in the most stylish way possible after learning the news of his death. Kate stepped out in London, David's hometown, sporting a t-shirt bearing an image of his face. She also added a pair of glittery platform boots that gave a nod to David's much-loved persona, Ziggy Stardust. She kept the rest of the outfit black, wearing a fur coat and leather trousers. David had a huge impact on the fashion world, but he struck up a particularly special friendship with supermodel Kate. Back in 2014, she accepted a BRIT award on his behalf, even taking to the stage in a playsuit he himself had worn. There was shock and sorrow as the world awoke to the news that David had passed away after a 'courageous' 18-month battle with cancer. Tributes to the musical icon quickly began to flood social media, with hundreds of stars publicly paying their respects to the Ziggy Stardust singer, and thanking him for his incredible influence on the music industry. Madonna, David Beckham and Kanye West were other celebrities to honour the star, who passed away on Sunday, two days after his 69th birthday. Sharing vintage photos of David, as well as a photograph of them together, Madonna wrote: "I'm Devastated. This great artist changed my life! First concert I ever saw in Detroit! RIP #rebelheart. "Talented. Unique. Genius. Game Changer. The Man who Fell to Earth. Your Spirit Lives on Forvever!.. "So lucky to have met you!!! Hot tramp I love you So! #rebelheart – Madonna." Kanye, meanwhile, hailed the musician for his inspiring career. "David Bowie was one of my most important inspirations, so fearless, so creative, he gave us magic for a lifetime," the rapper wrote. "I pray for his family and friends." Former footballer David also paid his respects to the fellow British star. "A creative genius and influence over is all… Rest in Peace STARMAN." Golden Globes host Ricky Gervais told his followers: "I just lost a hero. RIP David Bowie", with Australian actor Russell Crowe also paying tribute. "RIP David. I loved your music. I loved you," he wrote. "One of the greatest performance artists to have ever lived # sorrow." Cher wrote "Devastated" alongside broken heart emoji. "A legend is gone," she added.Iggy Pop also shared his sadness. "David's friendship was the light of my life," he said. I never met such a brilliant person. He was the best there is."